This well furnished, newly renovated unit is the home away from home your were looking for. The master bedroom downstairs has a lovely king bed with flat screen TV. Chef's kitchen has new cabinetry with all stainless steel appliances. 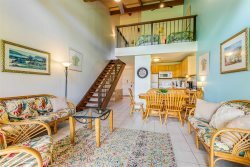 On the lanai you have magnificent mountain and golf course views with a comfortable dining table perfect for your morning juice or coffee. Inside you also have dining options for a family of 6. The living room has a flat screen TV and a split air conditioner to keep you nice and cool on those hot Hawaiian summer days. Upstairs you will find 2 queen beds and a bathroom with a split air conditioner. This unit is not on the ground floor. Unit is located on the grounds of Turtle Bay Resort.